Traveling to a completely unknown place is a great way to escape from the routine, to reinvigorate, or to begin again. But it can also be a huge challenge, if the travelers are musicians with a reputation and solid career, if they have to play music in front of a crowd who have no idea who they are. 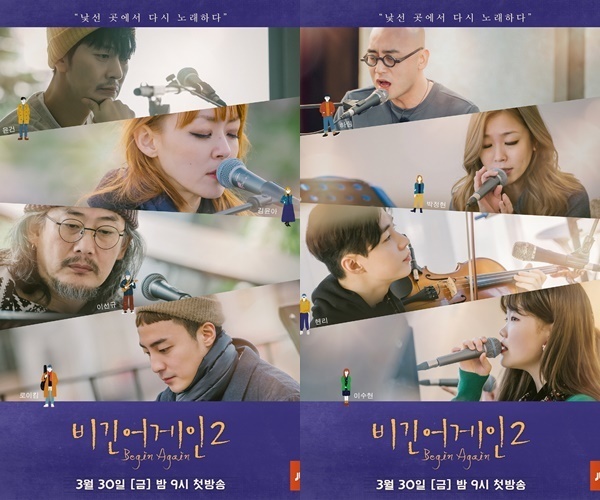 The second season of JTBC’s music variety show “Begin Again” focuses on how renowned Korean musicians turn into buskers and deal with performing their music on the streets of Lisbon in Portugal and Budapest in Hungary, where their names are unknown. Those who took on the challenge are Kim Yoon-ah and Lee Sun-kyu of band Jaurim, Lena Park, Hareem, Yoon Gun of Brown Eyes, Henry of Super Junior M, Roy Kim, Jeong Se-woon and Lee Su-hyun of Akdong Musician. Divided into two groups, the Jaurim members, Yoon and Roy Kim performed in Portugal, while the rest of the members teamed up in Budapest. “I used to busk a lot before taking on auditions. After making my debut, I thought I wouldn’t be able to do it again. But when busking on the streets of Budapest, I got so nervous that my voice literally trembled. I usually don’t have jitters when singing,” said Lee Su-hyun during a press conference for the show in Seoul on Friday. The freezing weather had numbed their hands and lips, but blending their tunes into the beautiful and exotic sceneries of European countries was an invaluable experience, the artists said. “It was so cold in Budapest, covered in snow. We performed on a bridge, and I hadn’t thought anyone would ever perform in this weather. But we performed like gypsies, with Su-hyunn and Lena galloping on the bridge with turbans around their heads,” recalled Harim. What the buskers emphasized was the “freedom” of emptying their minds, rather than the struggles of performing in front of foreigners. “Unlike the other team, our team is consisted of members whose music had never topped local music charts. We were the people who always worried over, ‘how many would listen to our song this time?” Kim Yoon-ah said. Lena Park also shared that she was able to sing without any distractions, saying she could focus solely on music, empty her mind with a mindset of a rookie. The first season of the show, which ended in September last year, featured musicians Lee So-ra, You Hee-yeol, Yoon Do-hyun and TV personality Noh Hong-chul as the host. The show was shot in a number of European countries, including Ireland, England, Switzerland and France. The second season of “Begin Again” aired its first episode on Friday.